Thursday, 16 June 2011 This is a numbered edition of 300 LPs in silk-screened covers. Each LP includes a download coupon. It's now on sale in our shop. 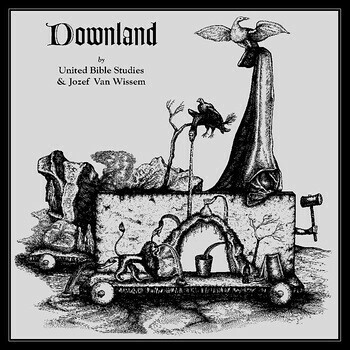 The album title 'Downland' is a play both on van Wissem's Lowlands home, and the Renaissance Lute composer John Dowland, rumoured to have been born in Ireland. The seeds of this collaboration were sown in late 2007, when United Bible Studies were part of the bill for van Wissem's first Irish concert. He was particularly taken with Paul Condon's bass playing and eventually wrote a piece with it in mind. Van Wissem began recording tracks for United Bible Studies to overdub and the postal collaboration began in earnest in 2009. 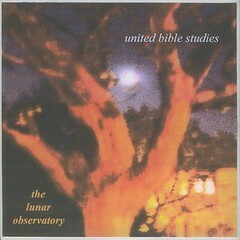 Wednesday, 1 January 2011 The Lunar Observatory is the latest from the United Bible Studies back catalogue to be made available as free download. Originally released as a CDR on Foxglove (Foxglove033) in 14 June 2004 in an edition of 120 copies. "These Deserted Village kingpins once again travel out into the woods and make music with all the forest creatures. Relaxed and soothing, "The Lunar Observatory" flickers like a distant star, offering up subtle, yet powerful, sounds. wheezing saxophone, scraped guitar strings, and melodic piano sprinklings come together in unison, singing for the sidereal plane. These guys are Ireland's finest export, and like an old bottle of Jameson, is best taken in small doses. Beauty defined."